Portrait of artist Ken Currie, in his studio in Glasgow, Scotland. ©Jeremy Sutton-Hibbert 2013, all rights reserved. 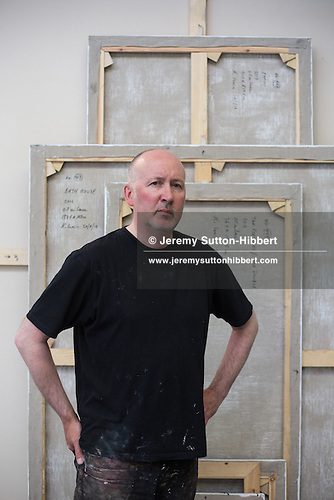 Last week I had the pleasure of a photography portrait assignment here in Glasgow, Scotland, to go and photograph renowned Glaswegian artist Ken Currie in his studio. Ken has a solo show of his paintings opening at the Scottish National Portrait Gallery on July 20th, and an editorial client of mine in London needed a portrait of him to accompany an interview with him. Some portrait jobs as I’ve mentioned previously are rushed, the sitter gives you only a few minutes, press officers hounding you and watching your every move. But not so this time. Ken, although he has his own stuff to get on with, was remarkably hospitable and friendly, answering all questions, imparting some of his own thoughts on art, and the Glasgow School of Art etc. As with previous portraits I’ve written about on here recently I once again shot in three locations within Ken’s studio, three different backgrounds to the photographs to give the picture editor a choice, but I think this is probably my preferred option. Not only was it the first backdrop, this is also the first frame I shot, and the one I prefer most. The editorial client used a different image, which whilst fine, wouldn’t have been the one I would have used. In the portrait above, Ken, of the ‘The Glasgow Boys’ artists from Glasgow School of Art, stands in front of the canvases which will make up his solo show next week, and he refused, in a very kind and gentlemanly way, to turn them round so that I could shoot with the paintings on display. There were various reasons for this he said; 1) he didn’t want to risk damaging the canvases at this late stage by turning them round; 2) he didn’t wish to turn them round in case he decided he wanted to make changes and to start tinkering with the paint at this late stage; and 3) he didn’t wish the public to see the paintings before the show opens in Edinburgh later this week. All valid reasons I felt so I didn’t push it, and to be honest, I was quite happy shooting the portrait with the backs of the canvases, it makes the image a little more generic and timeless, and more a portrait of Ken, as opposed to about the actual work. All in all a very enjoyable 20 minutes or so in the studio shooting the portrait, and in the company of Ken Currie, a very hospitable man.